AP&T provides the quality and reliability you would expect for basic telephone service combined with a comprehensive set of calling features and voice messaging. Please Contact Us at your local office to discuss pricing. Depending on service location, AP&T can provide a variety of calling features available individually upon request through your local office. Allows you to transfer incoming calls, but not existing calls, to another telephone number. While the transfer is in effect you will hear one short ring at your telephone when an incoming call is forwarded. You may still make calls from your telephone while the feature is enabled. Call Forwarding will remain in effect until you discontinue the feature from your telephone. Dial the activating code *72 (in some areas the activating code is 72#). Dial the number to which you want your calls transferred. Speed Calling codes may be used, if applicable. When the party answers, your forwarding is in effect. If there is no answer or the line is busy, depress the hookswitch/plunger for about 5 seconds, then repeat steps 2 to 5 within 2 minutes. When you hear 2 beeps, your Call Forwarding is in effect. If the party is unable to accept your Call Forwarding, you must discontinue the transfer (see below) before trying another number. Dial the deactivating code *73. (in some areas the deactivating code is 73#). Call Forwarding is now discontinued and you may replace the handset. Call Waiting alerts you that another call is waiting as it permits you to hold your first call and answer the second. A beep tone indicates another call is waiting, one reminder tone will be heard 10 seconds later if the second call still remains unanswered and the second caller hears the normal ringing tone only. Depress the hookswitch/plunger (or flash button) for about ½second to hold the first call. You will automatically be connected with the second caller. By depressing the hookswitch/plunger (or flash button) you may alternate between calls. End conversation with your party. When you answer it, you are connected to the second caller. Note: Call Waiting cannot be established if an additional instrument is in use on your line. This feature provides you with the ability to disable the call waiting feature for the duration of one call. You will not be disturbed while on this call. Also, it’s useful when transmitting data using a computer and you do not wish to have the call interrupted. Dial *70 (on rotary dial phones, dial 70 and wait four seconds). You will receive another dial tone. Place your call as normal. Call Waiting tones have been cancelled for this call. You can call up to 8 of your most frequently dialed numbers by calling a one-digit code. This includes long distance DDD numbers. When saving a long distance number, enter 1 + Area Code + Phone Number. The maximum number of digits you can program for each number is 28. Then dial the number you wish to speed code. At any time you may repeat this process for each number you wish to speed code, assigning each a different number. Push the # button. With a rotary dial phone, skip this step and allow a 4-second pause for your number to be connected. You can call up to 30 of your most frequently dialed numbers by dialing a two-digit code. This includes long distance DDD numbers. When saving a long distance number, enter 1+ Area Code + Phone Number. The maximum number of digits that you can program for each number is 28. Dial one of the 30 two-digit access code number (20-49). Then depress the # button. With a rotary dial phone, skip this step and allow a 4-second pause. Three Way Calling allows you to call another party and add them to your conversation. Depress the hookswitch/plunger (or flash button) for about one second to hold your existing call. Immediately dial the number of the third party. Speed calling codes may be used if applicable. When the third party answers, you may talk privately before completing your three way connection. To add the holding party, depress the hookswitch/plunger (or flash button) for about one second; your three way conversation is now in effect. If the third party does not answer or if the line is busy, depress the hookswitch/plunger (or flash button) twice and you will be reconnected to your original party. Depress the hookswitch/plunger (or flash button) for about one second. You will now be restored to your original call. If either of the other parties hangs up, you can continue talking with the one remaining. Note: Three way calling cannot be established if an additional instrument is in use on your line. When you subscribe to Caller ID, this service will route any incoming calls for a telephone number that is blocked to a recording. Your phone will not ring; instead, callers will hear a message indicating that you are not accepting calls that are blocked. Dial the activating code *77 (1177 for rotary phones). Listen for confirmation tone or announcement, and then hang up. Dial the deactivating code *87 (or 1187 for rotary phones). Per Call Blocking prevents your name and number from being delivered on a single call. Instead, the word “PRIVATE” or “ANONYMOUS” will display if you are calling someone who has Caller ID. At the time Caller ID is made available in your area, Per Call Blocking will be added to your line and there is no charge to use it. Dial the access code *67 (or 1167 on rotary phones). Per Line Blocking prevents your name and telephone number from being delivered on all calls. The word “PRIVATE” or “ANONYMOUS” will display if you are calling someone who has Caller ID. There is no charge for this service. However, if you order line blocking, then change your mind and have it removed, then reorder the service, a fee would apply for the second installation. The option of displaying your number on specific individual calls is available at no additional charge. Dial the access code *82 (or 1182 on rotary phones). If you receive harassing or obscene phone calls and feel that you need assistance, Call Trace may help. Upon request, traced information will be turned over to local law enforcement authorities. Under no circumstances will you be given the name or the telephone number of the person who called you. There is a $5 charge for each *57 activation. If the situation becomes life threatening, contact the police immediately. Press “*57” (1157 on rotary phones). A recording will confirm that your call has been traced. Last Call Return will identify/return the number of the last incoming call whether answered or not. Dial the access code “*69” (1169 for rotary phones). You will hear the number of the call you missed. If you want to return the call, press 1. If not, hang up. If the line is busy, listen for announcement and hang up. The busy line will be dialed for the next half hour. You will receive a special call-back ring when the line is free. Pick up the receiver and the number you are calling will ring. Press *89 (1189 on rotary phones). Dial the access code *64. Dial the access code *60. Selective Call Forwarding allows you to create a list of telephone numbers, and program them to be forwarded to a telephone number of your choice. Dial the access code *63. Dial the access code *83. Calling Number ID lets you see the number of the person calling you. The date and time of day each call was received can also be displayed. You need to have a Caller ID display device to use this service. For information on purchasing a display device, call your local business office. This service usually displays phone numbers that are inside your local calling area, unless the caller has blocked his number. If the number is not available, the screen will show “Out Of Area” or “Private Number” instead of the phone number. If you have Call Waiting and Calling Number ID, the phone numbers of waiting calls are not displayed because the unit must first hear one ring before it can display a number. Whether at home or as a business owner, you wouldn’t think of not returning an important call, much less one that may generate revenue. So why trust your important messages to a cell phone that may be out of range or battery power? Or worse, a piece of equipment that may malfunction, doesn’t take messages while you’re on the other line and stops working altogether if the lights go out? For just $2.00 per mo., AP&T’s new enhanced Voice Messaging eliminates each of those problems by eliminating the need for a machine, taking all of your calls while you’re busy on other lines and even continuing to work if the power is out! PLUS our e-mail notification feature allows you to have your Voicemail delivered to your e-mail as well….simply click and listen! To enter and setup your voicemail box from HOME, dial *94. When the greeting begins, press 0 for Mailbox Options. Next a voice prompt will guide you through the necessary steps to setup and personalize your mailbox allowing you to record your name, greeting, outgoing messages and passcode. Your security passcode must be a four (4) digit number, easy to remember, yet hard for someone else to guess. While setting up your voicemail, you may return to the main menu at any time by pressing the * key on your phone. To access your voicemail while out of town or from a wireless phone, dial the local access number shown that represents your home calling area. Next, enter your seven (7) digit home phone number (do not include the area code). Then, enter your security passcode number to access your messages. Once you have accessed your voicemail, the automated system will tell you if you have new messages and will give you prompts for additional options such as retrieving old messages, re-recording your outgoing message(s) or changing your passcode. Within each of the above Main Menu selections are several sub-prompts to assist in the management of messaging activity. The next panel provides a brief overview of the functions within each Main Menu Item. It is important to remember the maximum capacity of your mailbox is thirty (30) messages. This includes both new messages and old messages that have been saved. The maximum length of each message cannot exceed two (2) minutes. Callers will be unable to leave messages in a voicemail box that has reached the thirty (30) message capacity. Pressed 1, Listening To Messages: Users may play, save, delete, undelete and replay their messages. Pressed 2, Listen to Saved (Old) Messages: This option allows users to review and manage their saved messages. Pressed 0, Mailbox Options: This option provides the user with management tools to record and change your user name, all outgoing message greetings and your security passcode. REMINDER: In all menu modes, the user may press the * key to return to the main menu at any time. Similarly, the # key may be pressed to exit the voicemail system. AP&T Voicemail can send your voicemail directly to your email inbox each time a new message is received. Simply Click and Listen. Please speak with your local office to setup the AP&T Voicemail Email Notification for your service. 1. Check to see if all your telephones are hung up. 2. Perform a visual inspection of all exposed wiring and connections for damage or loose connections. 3. When there is more than one outlet, check each instrument at each outlet to determine if proper operation can be obtained from any outlet. If proper operation is obtained from any outlet, the trouble has been isolated to an instrument or house wiring. 4. In order to isolate jack or house wiring problems, simply move a working telephone to each outlet in the house to determine which location is causing the trouble. 5. Network Interface (NID) may have been installed where your telephone service wire comes into your premise. This test point is there to assist in isolating your wiring trouble from the telephone company’s trouble. 1. 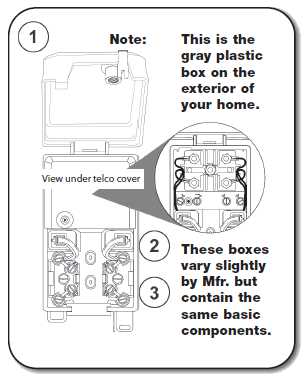 Inside cover information for step-by-step troubleshooting. CAUTION: Remove plug from test jack before making wire changes. TO TEST LINE: Remove plug from test jack-plug in working phone. If you can make a call, problem is inside house. If you cannot make a call, unplug phone, replace plug in test jack and contact your local office. 2. Plug RJ 11 Jack. Squeeze top of plug and gently pull straight out. 3. Inside wire, binding posts (all posts have color coded wires terminated to them. Please review the following documentation to understand how your telephone service will work in the event of a power outage. AP&T telephone service has been typically provided over copper local loop facilities and as we work toward providing service over fiber optic facilities there are some safety elements that we felt were necessary to disclose. Copper fed telephone service does not require electricity in order to use the service. Fiber fed telephone service is dependent upon electricity due to the use of an Optical Network Terminal (ONT) which derives its power from the customer premises electrical supply. Ensure that any backup power source is correctly installed. Periodically check the indicators on your backup power source to ensure that it is properly charged and functioning. Properly store your backup power source, not subject it to rough handling or excessive temperatures or otherwise subject it to abuse. If you purchase a backup power source on your own, ensure that it is compatible with AP&T’s telephone service. Use backup power sources judiciously during a power outage, remaining aware of factors that may shorten the lifespan of the backup source. In the event your leaving town and planning to shut off your power, the battery backup should be disconnected from the ONT as it could be damaged if left unpowered for a long duration. If you need any assistance with disconnecting your battery from the ONT, please contact your local AP&T office. In general, you should keep your battery in your backup power device and keep the equipment plugged into a working wall outlet so the battery remains fully charged and ready to power the phone in case of a power outage. If you retain a spare battery that is not being used in a device, it should be stored between 41 and 104 degrees Fahrenheit. Typically these types of batteries have an expected shelf life of 10 to 15 years if stored in the correct environment. The operating temperature is between 5 and 122 degrees Fahrenheit at full power and the typical battery recharge time is 10 hours. Local visual and audible alarming will occur by default for the following circumstances: On Battery, Low Battery, and Replace Battery. Once you put a battery in use it will not last forever and should be replaced every 1 to 2 years. verify both the operation of the backup battery and its condition. A number of factors may affect the amount of standby time and talk time you actually experience. For example, exposure to very hot or very cold temperatures and frequent power outages can reduce the amount of standby time and talk time your battery can provide. Talk time drains the battery faster than standby mode, so whenever possible you should minimize the amount of time you talk on the telephone during a power outage to lengthen the overall amount of time that the telephone service will operate. You should leave your backup battery plugged into a wall outlet so the battery remains fully charged and ready to power the phone in the event of a power outage. You can refer to the documentation provided upon purchase for specifics related to the expected duration of battery standby mode (meaning ready to receive and place phone calls) and telephone talk time if the battery is used and stored properly. Please contact your local AP&T office if you would like to purchase a battery backup or additional batteries which, if rotated in your telephone service equipment regularly, could extend the duration of backup power. In the event you would like to purchase a battery backup, if you suspect your current battery is not working properly or if you would like to purchase additional (spare) batteries, please contact your local AP&T office. Warranty information can be referred to within the instructions included with your battery upon purchase or by referring to the battery manufacturers website. AP&T provides Local Exchange Carrier (LEC) telephone services through the three companies below. ATC is the largest local exchange carrier in AP&T’s family of companies, originally called National Utilities, Inc. ATC serves the communities of Craig, Haines, Hollis, Hydaburg, Hyder, Klukwan, Metlakatla, Naukati, Petersburg, Skagway, Tanacross, Tetlin, Tok and Wrangell. AP&T purchased Bettles Telephone in 1993 as a wholly owned subsidiary. BTI serves the northern communities of Bettles, Jim River Camp and Allakaket. The Allakaket exchange was acquired in 1998 from Pacific Telecom Inc. now known as Alaska Communications Systems (ACS). BTI serves approximately 177 access lines. AP&T purchased North Country Telephone in 1994 as a wholly owned subsidiary. NCTI serves Eagle Alaska, which a long rich history related to the Gold Rush and the Yukon River. NCTI serves approximately 200 access lines.